The Elusive O Type, or O, My Goodness! Look What Just Turned Up! Friday evening there was a message on my machine: Ron Lesher was asking if I had heard of the discovery of an O type from Iowa. Ron said he wasn’t available until Sunday so I phoned Coleman Leifer. Yes, Coleman knew about the find. In fact, he had one in his possession. Eric Jackson had sent it to him. As it turned out, earlier in the week Coleman had been asked if he wanted one by another dealer who said he (the dealer) was to receive three of them shortly. The next day, I received one of the new O types in the mail. It isn’t pristine but it is nice and it is used, something of a real plus when considering that, up to now, most of the approximately 17 known examples of the O’s are unused. In fact, prior to the discovery of the new piece, I was aware of only three used O’s. I talked to Ron on Sunday. He thought there were six of the new checks found. But by Tuesday morning, when we talked again, the opinion was that Eric Jackson had purchased six from one party but had been offered ten more from a different source. This, supposedly, was the total number found. A book dealer in Illinois had purchased some papers, etc. from an estate. Included were 135 checks, including 21 of Type O. Two had been sold from his store, three more were being offered to my dealer friend and Eric Jackson had accounted for the other 16. Now we knew the facts. Or so we thought. I phoned Eric to make sure he knew that there were more than 16 pieces in the find. To my surprise, Eric told me that another 35 were now in the mail to him, making a total of 56! About a week later Eric phoned me back to say that he felt he finally had the accurate story of these pieces. The new O types indeed originated with a book dealer in Illinois. But it was from the dealer’s own family that they came. And the total, he was assured, was 56. The O suddenly has come into the reach of any serious (or semi-serious) collector! The very first time I saw an O type imprint was at the Turner Sale. That was, as you may remember, in Boston in July of 1980. Hot and humid on the outside, but nothing compared to the heat on the auction floor. Stanley Richmond hosted the “Great War” of revenue stamped paper collecting. There were two Type O’s in the sale. One was lotted with a select group of unused checks representing all of the major types from A to O, even including an unused I-2. The other O type was lotted separately. When it came up for sale, a gentleman who I had seen sitting beside me, but who had left the room, stuck his head in the door and bid the piece to $1,100 (plus 10%). At that time the catalog value of an O type was $150! By a sheer coincidence, a day later I was in a stamp and coin shop and I ran into this fellow. He was the proprietor. I asked him why he was so hot on the O type. This is what he told me. If you look closely you will see that the Type O is composed of a design incorporating a head of Liberty between the obverse and the reverse of a two-cent piece. Now, note the date on the coin. It is 1874. The numismatists among us know that the U.S. Mint last struck two-cent coins for circulation in 1872, although a few proofs were struck in 1873, before the denomination disappeared permanently. His interest was in the likeness of a two-cent coin dated a year later than any piece struck by the mint! Let me describe the Turner pieces. Both were identical Preston, Kean & Co. checks printed on a medium blue paper. The paper makes the orange of the imprint appear to be darker than it would on white paper. Both checks were unused. 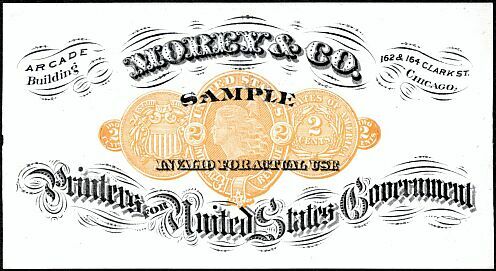 The printer of the checks is the now universally known Rand, McNally & Co. There are perhaps seven to ten of the unused Preston, Kean checks. Incidentally, one of these pieces was made very identifiable by J.N.T. Levick. Levick was a very active collector of revenues in the Nineteenth Century. He applied his handstamp to many revenue stamps and pieces of revenue stamped paper. 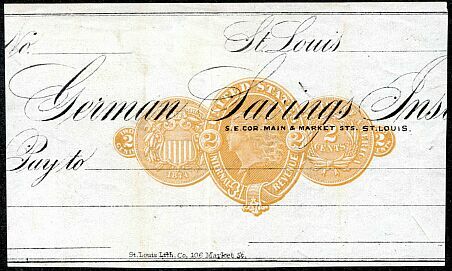 The check with Levick’s handstamp on the front has changed hands three times since it appeared as lot 860 in the J.L. McGuire sale of October 21, 1982. To my knowledge only one used example of the Preston, Kean and Co. check has ever appeared. Interestingly, it poses a problem. All of the known unused pieces have a blank dateline. The dateline on the used piece includes “Chicago.” Now, since all deliveries of the O type were made in September and October, 1874, it seems illogical to conclude that a second printing was required due to the first printing being all used up. More likely, the printer was required to produce some checks with “Chicago” on the dateline, some without it. To my knowledge all checks from this firm (including Type C-1, D-1, E-4 and J-4 for Lunt, Preston & Kean and Types D-1, F-1 numerous printings of G-1, L1-0 and 0-2 for Preston, Kean & Co. Bankers) had “Chicago” on the dateline. Only the unused 0-2’s have a blank dateline. A new user for the O type changed hands by private treaty in 1980. The unused check is from the National Bank of Commerce in Chicago. The paper is white; the imprint, though orange, is very close to yellow. Written in pen vertically upward across the center of the check is the word “Cancelled.” The check had been pasted down at one time, and it is possible that it came from a sample book. It appears to be unique. In the McGuire sale of March 25,1983, another O type was offered. It was the first time I had seen one of these checks from the Manufacturers Bank of Milwaukee. It has a medium orange imprint on white paper, and was printed by the Milwaukee Lithograph and Engraving Company. It appears that the Morton Dean Joyce Collection contained at least two more of these pieces. All are unused. Ed Lipson’s collection contains an O from the Union Trust Co. in Chicago. The piece is used, dated in December 1875, and was printed by the Union Lith. Co. I do not know of another example. Finally, a cut square of an O type from Saint Louis was in the Amon Carter Collection. After Carter’s death the piece changed hands in 1983, going into a collection in Texas, then passing through an Ivy, Shreve, Mader sale about two years ago and coming to rest in a well-known auction house where it has been offered on three occasions over the past 18 months. The Einstein, Kingsley, De Kay “Survey” reported a total of ten Type O documents and one cut square. We know that the Turner collection was not included in the Survey but Carter’s (at least a part of it) and Joyce’s collections were. Assuming that Turner’s two Type O’s, the used Preston, Kean example, the Pullman piece and National Bank of Commerce check were not in the survey, we can account for at least 15 entires and one cut square prior to the discovery of the Iowa find. I also suspect that the Milwaukee piece from McGuire’s 1983 sale was not in the survey, so perhaps 17 examples of the O were known. And that encompasses no less than six users! Now there appears to be seven users and a total of close to 75 extant Type O’s. And the super-rare used pieces are now part of a group representing over 80% of the total. Remember the title to the article in The American Revenuer describing last November’s Joe Antizzo Sale? It was “Yes, Virginia, now is the time to buy revenue stamped paper! The only known sample of Type O.
Czech, Ben (Ronald Lesher), Who Printed the Type O Revenue Stamped Paper? The American Revenuer, June 1990, pp. 126-127. Czech, Ben, A Used Type O Check. The American Revenuer, June, 1991, pp. 117-118. Einstein, J., T.C. Kingsley and W.R. DeKay. A Handbook of United States Revenue Stamped Paper. The American Revenue Association, 1979. Lesher, Ronald. Personal correspondence. I wish to thank Ron for his helpful suggestions and for supplying some of these facts, plus illustrations of the used Preston, Kean check and the only known sample of Type O.